The main ghetto square. Photo by Ruth Ellen Gruber. The Jewish community currently numbers fewer than 450 affiliated members. Many, like Bassi, can trace their lineage here back for centuries. Few of them live in the ghetto, though the area remains the center of spiritual and institutional life. Some fear that without more active Jewish input, it could become a beautiful but empty shell, a tourist attraction without its beating heart. “It’s a tiny community with a lot of history,” says Aldo Izzo, a retired sea captain in his 80s. As a boy, he survived the Holocaust here in hiding and now lives on the Lido, where he looks after the ancient Jewish cemetery. On Saturdays, Izzo makes a 40-minute trip by vaporetto (water bus) to attend services in the ghetto. Activists agree that securing a living future for Jewish Venice will require reaching out to the international Jewish world as well as to the tens of thousands of tourists and visitors who make their way each year to the ghetto. Chief Rabbi Scialom Bahbout and Lenore Rosenberg Bahbout. Photo by Ruth Ellen Gruber. Until fairly recently, Venetian Jewry showed little interest in such engagement. Chabad took up the slack, with a range of activities almost entirely directed toward visitors. It opened a Chabad House and yeshiva on the ghetto square as well as a kosher restaurant, Gam Gam, that for years has welcomed tourists to Friday night dinners that in high season can spill out into the street. Several years ago, the Jewish community took its own steps by opening an information office for tourists and other visitors. More recently, it opened the kosher restaurant Ghimel Garden, which features an upscale menu as well as services that include cultural events, Shabbat dinners, Sunday brunches and post-synagogue Kiddush gatherings that can draw more than 200 people. 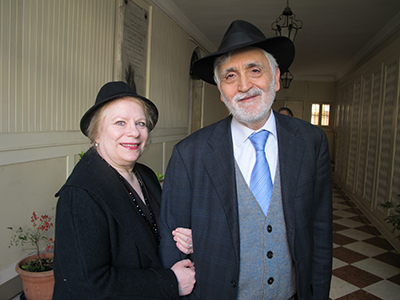 “We are still alive, and we have many ideas and innovative suggestions to give meaning to our presence here,” says Scialom Bahbout, who took up his post in Venice less than two years ago, after a distinguished career in Jewish education and outreach and serving as the chief rabbi of Naples and Southern Italy. Bahbout particularly wants to make Venice a point of reference for in-depth Jewish scholarship through a planned project he calls Maimonides, which would foster international student exchanges. 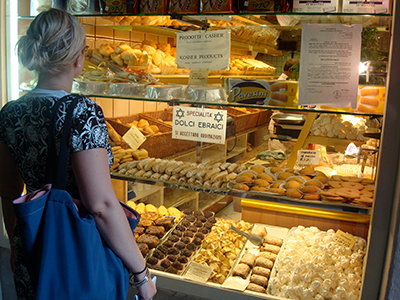 A kosher bakery in the ghetto popular with Jewish tourists. Photo by Ofir Barnea. 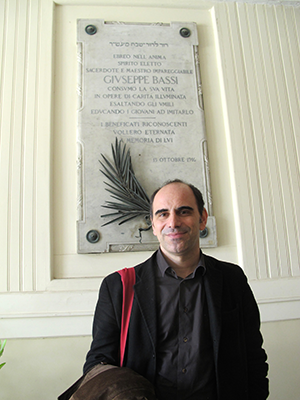 Bassi, who teaches English literature at Venice’s Ca’ Foscari University, hopes to make the city an international center for Jewish arts and culture through the activities of Beit Venezia, a Jewish cultural organization he heads. “The idea is to bring people here to live, learn and create in Venice and, in some way, become part, even temporarily, of the Jewish community,” he says. For Beit Venezia’s New Venice Haggadah Project, for example, Bassi brought eight artists to Venice in October 2015 for a three-week residency inspired by the richly illustrated Venice Haggadah, one of the earliest printed haggadot when it was published in 1609. The artists, from countries including Britain, Israel and Slovakia, studied the Haggadah and interacted with local Jews. Each was assigned a portion of the Seder ritual to illustrate. An exhibit of their finished works opened at the Jewish Museum of Venice on April 17, and they will be published as a modern illustrated Haggadah next year. 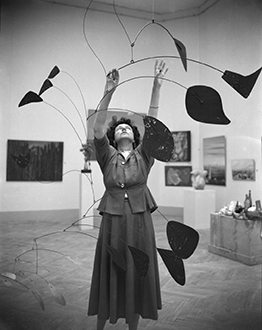 ‘Peggy Guggenheim with Alexander Calder’s Arc of Petals at the Venice Biennale,’ Venice, 1948. Peggy Gug­gen­heim Collection Archives, Venice. Photo Archivio meraphoto Epoche. Gift, Cassa di Risparmio di Venezia, 2005. 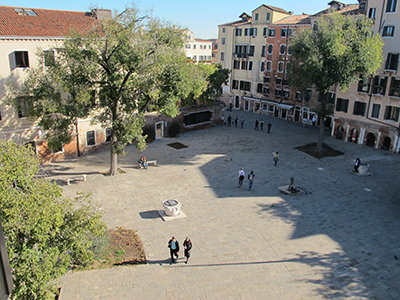 The Jewish Museum of Venice could play a key role in shaping that future. Founded by local Jews in 1953, it displays precious ritual objects in cramped premises on the Ghetto Nuovo plaza. It is already the community’s most visible, and visited, institution, drawing 80,000-plus visitors a year. As part of the quincentennial, the Venetian Heritage Foundation launched a $10-million fundraising drive to revamp, enlarge and modernize the museum as well as restore the ghetto’s 16th-century synagogues, which can be visited as part of the museum tour. Visit veniceghetto500.org for more information on events. THIS PLACE IS INCREDIBLE I HAVE BEEN THERE A COUPLE OF TIME AND IT ALWAYS MESMERIZES ME.THE HISTORY IS A RECOMENDED TRAVEL PLACE.